I was keen to blog over the Christmas/New Year break, but being away from my computer meant that I had to save my enthusiasm until my computer and I were one again. These are the socks I gave my sister for Christmas. I was aiming for retina burning, and retina burning is what she got. The skein was split into two, and knit alternating stripes of three rows from each skein half. I could have made them a bit longer, but due to time constraints, I chose to leave them a little shorter. It was for the best anyway, as it meant that the Elijah twins could have scarves from the scraps. There seems to be a bit too much twist to the Noro sock yarn, as it had a tendancy to twist back on itself no matter how careful I was with it. I’ve worked with non-sock kureyon before and didn’t notice the twisting issue. Besides that small annoyance, it was fine to work with. I must admit, I’m a bit funny when it comes to Noro. 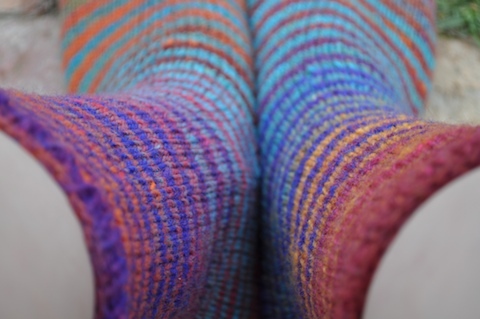 I’m not really into variegated/self striping yarn, but I like Noro’s long colour changes. 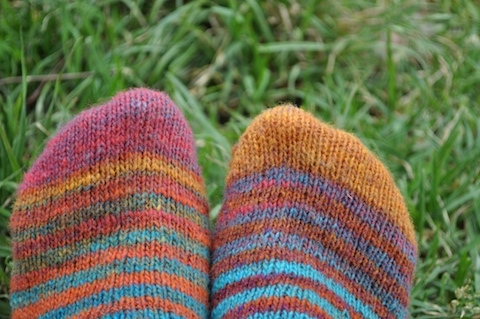 However, having said that, my favourite uses of Noro are when the colour changes is broken up by stripes or entrelac. These are so lovely. I hope she liked them – if not, my birthday is in September! !